We aimed to assess the effect of ovariectomy on cartilage turnover and degradation, to evaluate whether ovariectomized (OVX) rats could form an experimental model of postmenopausal osteoarthritis. The effect of ovariectomy on cartilage was studied using two cohorts of female Sprague–Dawley rats, aged 5 and 7 months. In a third cohort, the effect of exogenous estrogen and a selective estrogen receptor modulator was analyzed. Knee joints were assessed by histological analysis of the articular cartilage after 9 weeks. Cartilage turnover was measured in urine by an immunoassay specific for collagen type II degradation products (CTX-II), and bone resorption was quantified in serum using an assay for bone collagen type I fragments (CTX-I). Surface erosion in the cartilage of the knee was more severe in OVX rats than in sham-operated animals, particularly in the 7-month-old cohort (P = 0.008). Ovariectomy also significant increased CTX-I and CTX-II. Both the absolute levels of CTX-II and the relative changes from baseline seen at week 4 correlated strongly with the severity of cartilage surface erosion at termination (r = 0.74, P < 0.01). Both estrogen and the selective estrogen receptor modulator inhibited the ovariectomy-induced acceleration of cartilage and bone turnover and significantly suppressed cartilage degradation and erosion seen in vehicle-treated OVX rats. The study indicates that estrogen deficiency accelerates cartilage turnover and increases cartilage surface erosion. OVX rats provide a useful experimental model for the evaluation of the chondroprotective effects of estrogens and estrogen-like substances and the model may be an in vivo representation of osteoarthritis in postmenopausal women. Osteoarthritis (OA) is a major cause of functional impairment and disability among the elderly , yet current therapies predominantly target symptoms rather than providing prevention or curative treatment. Animal models of OA have been used extensively for studying the pathogenesis of cartilage degradation as well as the efficacy of potential therapeutic interventions . However, most of the currently available models only approximate the mechanisms underlying the human disease. Although several animal species – such as mice, Syrian hamsters, guinea pigs, and nonhuman primates – can develop spontaneous OA, the development of disease in these models is slow; typically, more than 9 to 12 months is required for significant cartilage erosion to occur . Consequently, these spontaneous models are cumbersome and time-consuming to use in arthritis research and drug development. Transgenic mice models have been of great help in clarifying the role of numerous pathogenic factors (matrix metalloproteinases, transforming growth factor β, nitric oxide) in the development of OA, yet these models may not be applicable for studies testing the therapeutic potentials of chondroprotective agents [3, 4]. Surgically induced joint damage has also been used extensively as a model of OA, though this condition more nearly approximates a traumatic form of OA than it does the natural, spontaneously evolving form . Thus, there is an apparent need for an OA model that directly mimics a human form of the disease and at the same time provides a convenient methodological tool for preclinical investigations. Development of such a generally applicable and convenient animal model of OA is complicated by the fact that our current understanding of the pathophysiology of the human disease is incomplete. However, one factor thought to affect the regulation of cartilage turnover is estrogen. The putative role of estrogens is corroborated by the fact that the prevalence of OA is higher in post-menopausal women than in men [6–8]. Furthermore, the recent finding that ovariectomized (OVX) cynomolgus monkeys show OA-like pathological changes within articular joints , as well as the chondroprotective effects of hormone replacement therapy proposed by some epidemiological observations [10, 11], also argues for the involvement of estrogen deficiency in female OA. The present study was designed to evaluate the role of estrogen in regulating cartilage turnover, by investigating the effects of ovariectomy on cartilage. Histological analysis of the knee joint was used to assess the pathological changes of the articular cartilage erosions. Furthermore, the effects of cessation of endogenous estrogen production on bone and cartilage turnover were assessed using biochemical markers of collagen type I and II degradation (CTX-I and CTX-II). An additional aim was to clarify whether OVX rats could provide a useful model of post-menopausal OA for future preclinical studies assessing the chondroprotective effects of exogenously administered estrogens and estrogen-like substances such as selective estrogen receptor modulators (SERMs). Sprague–Dawley rats (Crl:CD®(SD)IGS.BR) obtained from Charles River Laboratories, Kisslegg, Germany, were used. Experiments were approved by the Experimental Animal Committee, Danish Ministry of Justice (Slotsholmsgade 10, DK-1216, Denmark) (approval number 2002/561-566) and were done in accordance with the European Standard for Good Clinical Practice. The animals were maintained at the Animal Research Facilities at Nordic Bioscience for 1 month before the start of experiments. They were housed, two per cage, in a room maintained at 20°C with a 12-hour/12-hour light/dark cycle and given food (Altromin 1234, Lage, Germany) and Milli Q water (Millipore, Glostrup, Denmark) ad libitum. To assess age-related changes in cartilage turnover, we measured the creatinine-corrected excretion of CTX-II (for details see below) in the urine of six male and six female rats sampled at 1, 2, 3, 6.5, and 9.5 months of age. Urine samples were obtained as spot samples by placing the rats in a metabolic cage for 30 to 60 min and waiting for them to urinate. For these studies, two cohorts of 20 virgin female Sprague–Dawley rats were used. At the start of the study they were either 5 months old (cohort A) or 7 months old (cohort B). At this baseline, body weight was determined and the animals were randomly stratified into two groups to undergo either bilateral ovariectomy using a dorsal approach or a standard sham operation under general anesthesia induced by Hypnorm-Dormicum (1 part Hypnorm® + 1 part Dormicum® + 2 parts sterile deionized water; dose 0.2 ml/100 g body weight). During the 9 weeks of follow-up, body weight was determined weekly; urine samples were obtained at baseline and weeks 2, 4, 6, and 9 after ovariectomy. At study termination, the knees were isolated and kept in 4% formaldehyde until further quantification of surface erosion in the articular cartilage by histological measurements as outlined below. For this purpose, a cohort of 60 5-month-old virgin female Sprague–Dawley rats was included. At baseline, body weight was determined and the animals were randomly stratified into five groups with 12 rats in each group. One group was subjected to sham operation and the remaining four groups were ovariectomized as described above. The four equal groups received treatment either with the vehicle (50% Propylene Glycol [Unikem, Copenhagen, Denmark], 0.075 M NaCl), or with 17α-ethinylestradiol (E-4876, Sigma, St Louis, MO, USA) (0.1 mg/kg per day), or with the SERM (-)-cis-3,4-7-hydroxy-3-phenyl-4-(4-(2-pyrrolidinoethoxy)phenyl)chromane  given as an oral suspension in the vehicle from day 1 by gavage 5 days a week for 9 weeks, in either a low or a high dose (0.2 or 5 mg/kg per day, respectively). Animals were weighed and sampled for spot urine and serum at regular intervals. At study termination, knee joints were prepared for histology as described below. All chemicals were analytical grade and purchased from either Sigma or Merck (Darmstadt, Germany). Peptides, from Chimex Ltd (St Petersburg, Russia), were >95% pure. Cell-culture reagents were obtained from Life Technologies, UK. The buffers used in the immunoassays have been described elsewhere [; P Qvist and colleagues, unpublished]. After careful dissection, the knees were decalcified for 3 to 4 weeks in 10% formic acid, 2% formaldehyde. The decalcified knee joints were cleaved along the medial collateral ligament into two sections and embedded in paraffin. Coronal sections were then cut at three different depths (0, 250, and 500 μm) from the medial collateral ligament. Each section was stained in Toluidine blue and the section that comprised the most load-bearing region were used for measurements. The histological sections were assessed by a blinded observer. In a preliminary study, we evaluated apparent histological features as well as applicable assessment methods for quantifying pathological changes in the knee joints. The previously described Mankin and Colombo score systems are used in analyzing known OA models such as the guinea pig, and may not fulfil the criteria for a reliable scoring system in this OVX rat model . In the preliminary study, we analyzed OVX and sham-operated rats by the Colombo method and found that erosion was the feature most readily influenced by the ovariectomy in the OVX rats in comparison with the sham-operated rats. In order to simplify evaluation protocols and increase the robustness of the scoring system, we found it more reproducible to concentrate evaluation on surface erosion as the main feature of cartilage damage. Exact numerical values were obtained by measuring the length of the erosion surface and dividing it by the total cartilage surface. This approach enabled us to quantify erosion in exact numerical values instead of scores relying on the observer. Furthermore, it relates to a feature that is directly relevant to development of OA lesions. We therefore decided to keep the analysis simple and focus on surface erosion. The RatLaps ELISA (Nordic Bioscience Diagnostics A/S, Herlev, Denmark) measures collagen type I C-telopeptide degradation products (CTX-I) using a specific monoclonal antibody in a competitive ELISA form [P Qvist and colleagues, unpublished]. The assay is applicable for measurement of both urine and serum samples, but only serum samples were assessed in this study. All serum samples measured in the assay were from animals that had been fasting for at least 6 hours prior to the sampling. Briefly, the assay is performed by incubating a biotinylated form of a synthetic peptide representing the C-telopeptide epitope EKSQDGGR. This is followed by addition of sample and primary antibody and after overnight incubation the amount of bound antibody is made visible using a peroxidase-labeled secondary antibody and a chromogenic peroxidase substrate. The concentrations in the samples were determined from the construction of a calibration curve based on the measurement of synthetic peptide standards. Intra-assay and interassay variations were 6.9% and 10.4%, respectively. All samples were measured in duplicate and samples from the same animal were included on the same microtiter plate. Three genuine control samples were included on each microtiter plate to verify performance, and samples were remeasured if the coefficients of variation exceeded 15% or if any of the control samples measured more than 20% off the predetermined value. Monoclonal antibody mAbF46 specific for collagen type II C-telopeptide fragments (CTX-II) was used in a competitive ELISA format developed for measurement of CTX-II in urine samples (CartiLaps ELISA, Nordic Bioscience Diagnostics A/S) . The assay was performed by first incubating biotinylated collagen type II C-telopeptide-derived peptide (EKGPDP) on a streptavidine microtiter plate, and then the sample as well as the primary antibody were added. After overnight incubation, the plates were washed and a peroxidase-labeled secondary antibody was added, followed by a chromogenic peroxidase substrate. The concentrations of CTX-II (μg/l) were standardized to the total urine creatinine (mmol/l) (JAFFA method; Hoffmann-La Roche, Basel, Switzerland) giving concentration/creatinine (μg/mmol). The precision of the assay was 7.1% and 8.4% for intra-assay and interassay variations, respectively. Assay performance and quality assurance were treated as described above for the CTX-I assay. Means and SDs were calculated using parametric statistics. Differences between groups were assessed with the Mann–Whitney U-test for unpaired observations. The association between the biomarkers and the histology data was calculated using Spearman's rank correlation. Cartilage turnover occurs predominantly in the articular cartilage and in the ectopic growth plate during skeletal growth. We first wanted to assess cartilage turnover levels in normal Sprague–Dawley rats, to identify the age at which the turnover stabilizes. Normal levels of collagen type II turnover were assessed in Sprague–Dawley rats by obtaining samples from six male and six female rats, each tested at 1, 2, 3, 6.5, and 9.5 months of age. Creatinine-corrected urinary CTX-II levels are shown in Fig. 1. This marker decreased substantially over the investigated age range in both sexes. This decline was most pronounced in animals younger than 3 months of age, implying that older animals should be used in studies of articular cartilage turnover to minimize contribution from the growth plate. Normal levels of CTX-II (collagen type II fragments; μg/mmol, creatinine-corrected) in six male and six female Sprague–Dawley rats. Error bars indicate SEM. Two cohorts each comprising 20 female Sprague–Dawley rats were used to assess the effect of ovariectomy on cartilage turnover and erosion. The animals were aged 5 months (cohort A) or 7 months (cohort B) at the start of the study. Two animals in cohort A and three in cohort B died at the start of the study because of hypersensitivity to general anesthesia or extensive hematoma that occurred during blood sampling. The baseline characteristics of the rats included in the study are shown in Table 1. Values are means ± SD. Difference between OVX and sham-operated rats were assessed using the nonparametric Mann-Whitney U test: aSham-operated. **P < 0.01, ***P < 0.001. OVX, ovariectomized. Ovariectomy induced significant weight gain in the animals, reaching 27% and 17% in the 5- and 7-month-old cohorts, respectively, after 9 weeks (Table 1). The corresponding changes in the sham-operated groups were 10% and 6%, respectively. At study termination, the wet weight of the uterus was measured. Ovariectomy induced significant regression of the uterus in both cohorts, compared with age-matched sham-operated animals (Table 1). Sixty 5-month-old rats were used to study the effect of estrogen and SERM administration (cohort C; Table 2). Two animals from the sham-operated group and one each from the estrogen and low-dose SERM groups died during surgery at the start of the study. At baseline, there were no significant differences in body weight (Table 2) or in levels of CTX-I and CTX-II in the five study groups (data not shown). At study termination, after 9 weeks of treatment, uterus weights in the SERM-treated groups were slightly higher than in the vehicle-treated group. The sham-operated and estrogen-treated groups had significantly higher uterus weights, which is in accord with the uterotropic effects of estrogen, and the uterus weights in the estrogen group were lower than in the sham-operated group (Table 2). Body weights were significantly decreased in the OVX estrogen-treated and OVX high-dose SERM-treated rats at the end of the experiment in comparison with the OVX vehicle-treated rats (Table 2). Values are means ± SD. aVehicle (50% propylene glycol, 0.075 M NaCl); bLow dose (0.2 mg/kg per day); cHigh dose (5 mg/kg per day). Difference from the OVX group treated with vehicle only, assessed using the nonparametric Mann-Whitney U test: *P < 0.05, **P < 0.01, ***P < 0.001. OVX, ovariectomized; SERM, selective estrogen receptor modulator ((-)-cis-3,4-7-hydroxy-3-phenyl-4-(4-(2-pyrrolidinoethoxy)phenyl)chromane). In a preliminary study, we evaluated histological assessment methods to find out which were best suited to assess articular cartilage damage in ovariectomy. The previously described scoring systems by Mankin and Colombo are used for analyzing guinea pigs, which have a different pathology and histological appearance . They did not appear to fulfill the criteria for a reliable scoring system in this rodent model. We scored 12 rats (6 OVX, 6 sham-operated) according to Mankin and Colombo's criteria by assessing the cartilage surface (loss of superior layer, fibrillation, and erosion), the cartilage matrix (territorial loss, interterritorial loss, and vascularization), and the chondrocytes (loss, disorganization, and clones). All nine parameters were higher in the OVX rats than in the sham-operated rats, but erosion, especially, was increased more than threefold (data not shown). In order to simplify the evaluation procedure and increase the robustness of the scoring system, we found it more reproducible to assess the most prominent feature of the disease, surface erosion. This approach also results in a numerical value for the surface erosion, expressed as a percentage of the total cartilage surface, instead of scores determined subjectively by the observer. Knee joints were excised after termination of the experiments and analyzed histologically by looking at Toluidine-blue-stained coronal cross sections showing the femoral and tibial condyles (Fig. 2a). The surface erosion (Fig. 2b) was measured as the percentage of the total articular cartilage surface. Fig. 3 shows the Toluidine blue staining of the articular cartilage in 7-month-old rats subjected to either sham operation (Fig. 3a,3c) or ovariectomy (Fig. 3b,3d). The measured surface erosion is indicated by the frame (Fig. 3b), and below is the same section shown through a Polaroid filter (Fig. 3d), which indicates alterations in the structure of the collagen fibers compared with the intact cartilage surface (Fig. 3a) and collagen structure (Fig. 3c) of the sham-operated rat. OVX groups of all cohorts showed increased surface erosion in the medial tibia, medial femur, and lateral femur compared with the sham-operated groups. The effect of ovariectomy on surface erosion was more pronounced in the 7-month-old rats, particularly in the lateral femur, where differences in comparison with the sham-operated rats reached statistical significance (P = 0.009) (Fig. 4). In 7-month-old animals, the total measure describing the severity of cartilage surface erosion over the four areas of interest also indicated significantly more severe surface erosion in the OVX group than in the sham-operated group (P = 0.008) (Fig. 4). Knee sections, stained with Toluidine blue, showing effects of sham operation (a,c) or ovariectomy (b,d) in 7-month-old rats. In (c) and (d), the structure of the collagen fibers is visualized by polarized light. The sham-operated rat (a,c) shows a healthy articular cartilage surface, whereas the ovariectomized rat (b,d) shows surface erosion (b, framed area) and alterations in the structure of the collagen fibers (d, framed area). Scale bars: 200 μm. 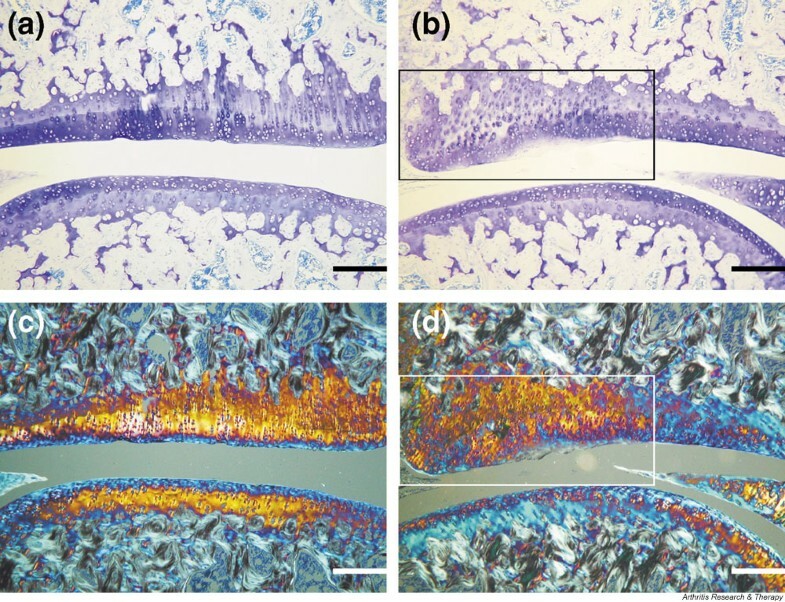 Cartilage surface erosion in four condyles in 5-month-old (a) and 7-month-old (b) female rats maintained for 9 weeks after ovariectomy or a sham operation. The erosion (expressed as percentage of total cartilage surface) is presented as mean erosion + SEM for the two groups (OVX and sham-operated). Mean scores are represented for each of the four condyles – medial tibia (Medial T), medial femur (Medial F), lateral tibia (Lateral T), and lateral femur (Lateral F) – and for all four taken as a group (Total). P values indicate difference between ovariectomized (OVX) and sham-operated rats assessed using the nonparametric Mann–Whitney U test. When cartilage surface erosion was assessed in vehicle-treated 5-month-old OVX rats from the intervention study (cohort C), similar results were obtained (Fig. 5). The most severe surface erosion of the articular cartilage was seen in the medial and lateral femur, but the total measure was also significantly higher in these vehicle-treated OVX animals than in the sham-operated group (P = 0.012). Estrogen-treated OVX animals displayed surface erosions similar in severity to those in the sham-operated group. Hence, surface erosion measurements for the medial and lateral femur, medial tibia, and total knee joint of the estrogen-treated group were significantly lower than for the vehicle-treated OVX group. The two groups of SERM-treated animals also showed less severe surface erosion. The high-dose SERM group showed a similar incidence of cartilage erosion to that seen in estrogen-treated rats. In addition, the severity measurements were significantly lower than in the medial and lateral femur, lateral tibia, and total knee joint of the vehicle-treated group (Fig. 5). The group treated with low doses of the SERM showed reduced surface erosion, but the effect was not as pronounced as in the high-dose group. Only the measurement for the medial femur of the low-dose SERM group was significantly lower than that in the vehicle-treated OVX group (P = 0.018). Severity of cartilage surface erosion in knee-joint cartilage of 5-month-old ovariectomized (OVX) rats treated with the vehicle alone (OVX vehicle), with estrogen (OVX estrogen), or with the selective estrogen receptor modulator (SERM) (-)-cis-3,4-diarylhydroxychromane, given in either a low dose (0.2 mg/kg per day; OVX SERM low) or a high dose (5 mg/kg per day; OVX SERM high). Means for vehicle-treated sham-operated rats are also included (Sham). The erosion is expressed as percentage of total cartilage surface. The left side of the graph shows the accumulated total mean score for all four joint compartments (medial and lateral femur and tibia) and the right side, for the medial femur only. Error bars indicate SEM. The significance of differences between treatment groups and the OVX vehicle group was assessed using Student's t-test. *P < 0.05, **P < 0.01, ***P < 0.001. Bone and cartilage turnover were quantified in all rats by measurement in serum of CTX-I and urinary measurement of CTX-II, reflecting bone and cartilage turnover, respectively. The 5-month-old cohorts had higher levels of both markers. For CTX-I, the baseline levels were 49.2 ± 13.9 ng/ml and 26.9 ± 14.7 ng/ml in the 5- and 7-month-old rats, respectively (mean ± SD). For CTX-II, the corresponding baseline values were 2.25 ± 0.83 and 0.85 ± 0.42 μg/mmol. In line with the histological findings, ovariectomy induced significantly increased CTX-II levels in all cohorts (Figs 6 and 7). The increase in CTX-II was most pronounced at week 4 after ovariectomy, showing a decreasing tendency thereafter. Nine weeks after ovariectomy, there was no significant difference between CTX-II levels in the OVX and sham-operated groups. The OVX rats treated with estrogen and the highest dose of SERM presented CTX-II levels similar to those in the sham-operated group (Fig. 7). The low dose of the SERM showed intermediate effects on CTX-II levels. Cartilage and bone turnover in the ovariectomized (OVX) and sham-treated (SHAM) rats. Cartilage turnover was assessed using collagen type II fragments (CTX-II) as a marker (a,b), and bone resorption was determined by measurement of collagen type I fragments (CTX-I) (c,d). Measurements, made at the weekly intervals shown, are from rats that were (a,c) 5 months old and (b,d) 7 months old at the beginning of the study. Data are presented as average percentage of individual baseline, with error bars representing SEM. Bone and cartilage turnover in 5-month-old ovariectomized (OVX) rats treated with vehicle alone (OVX vehicle), estrogen (OVX estrogen), or the selective estrogen receptor modulator (SERM) (-)-cis-3,4-diarylhydroxychromane, given in either a low dose (0.2 mg/kg per day; OVX SERM low) or a high dose (5 mg/kg per day; OVX SERM high). Values for vehicle-treated sham-operated rats (Sham) are also included. Bone resorption was determined by measurement of collagen type I fragments (CTX-I) (a), and cartilage turnover was assessed using collagen type II fragments (CTX-II) as a marker (b). Measurements were made at the weekly intervals shown, starting when the rats were 5 months old. The significance of differences between groups was assessed by nonparametric analysis of variance (ANOVA). *P < 0.05, **P < 0.01, ***P < 0.001. The effect of ovariectomy on bone resorption was clearly reflected by the elevation in serum CTX-I concentration (Figs 6 and 7). The OVX rats treated with estrogen had CTX-I levels similar to those in the sham-operated group (Fig. 7). However, even the highest dose of the SERM compound was not able to suppress bone resorption to the same extent as estrogen, indicated by the less pronounced decrease in the CTX-I marker. The animals treated with a low dose of SERM showed even less pronounced effects on CTX-I levels. The association between bone and cartilage turnover markers CTX-I and CTX-II was assessed in baseline samples from the three study cohorts. The correlation coefficients (Spearman's rho) were between -0.04 and -0.30 (P > 0.05), indicating that at baseline there was no prominent association between bone and cartilage turnover in the rats (data not shown). The correlation between the severity of cartilage damage and CTX-II or CTX-I was calculated for each study cohort (Table 3). CTX-I levels did show significant correlation with the surface erosion in cohorts A and B (Table 3), in accord with the specificity of this marker for bone resorption. In cohort C, however, there was a correlation between changes in CTX-I levels during the first 4 weeks of treatment and subsequent erosion at termination, after 9 weeks of treatment (Table 3). This may be due to the similarities in dynamics of the responses seen with the CTX-I and CTX-II marker in this intervention study (Fig. 7). Values are Spearman's rho. aCohorts: A, see Table 1; B, see Table 1; C, intervention with either estrogen or SERM – see Table 2. bSham operation. *P < 0.05, **P < 0.01, ***P < 0.001. CTX-I, collagen type I fragments; CTX-II, collagen type II fragments. Significant correlations were found between 4-week changes in CTX-II levels and final measurements of cartilage surface erosion (total knee) in study cohorts B and C (r = 0.74 and 0.50 respectively). Also, the absolute levels of CTX-II at week 4 were significantly correlated with the severity of cartilage surface erosion in these two studies. In cohort A, comprising 18 5-month-old rats, there was a correlation between CTX-II change and surface erosion, but it did not reach statistical significance. When the four compartments of the knee were considered individually, the highest correlations were observed for the medial femur (in which the highest surface erosion was seen), where significant correlation with both absolute levels and changes in CTX-II was found in all study cohorts (Table 3). Significant correlations were also found for the lateral femur. Figure 8 depicts the association between cartilage surface erosion and changes in CTX-II observed in cohort C. All rats from this cohort were stratified in quartiles according to the magnitude of change in CTX-II levels, and the average surface erosion in each quartile was calculated. Rats in the highest quartile (showing the largest increases in CTX-II levels) included 11 of the 12 rats from the vehicle-treated OVX group, and these animals showed significantly more surface erosion than rats in the lower quartiles. Correspondingly lowest surface erosion was seen among the animals of the lowest quartile of CTX-II change. The differences between the quartiles were highly significant as assessed by analysis of variance (ANOVA) (P = 0.001). Association between cartilage surface erosion (score for total knee) and collagen type II degradation products (CTX-II). 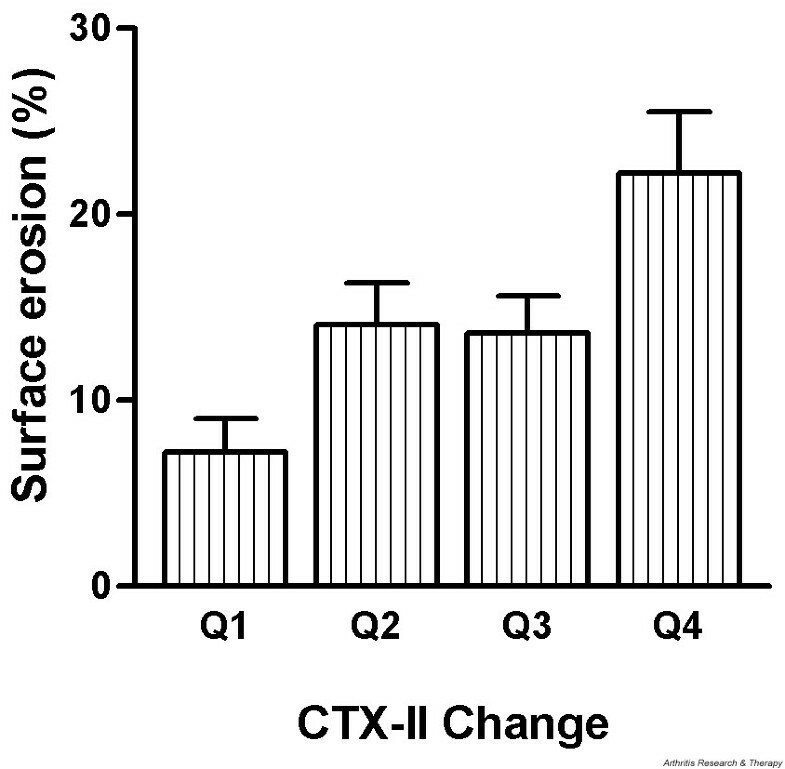 Rats from all treatment groups in cohort C (see text and Table 2) were stratified according to CTX-II change after 4 weeks and the average surface erosion for each quartile (Q) is presented. Error bars indicate SEM. P = 0.001 by nonparametric analysis of variance (ANOVA). Body weight did not correlate with the severity of cartilage surface erosion. The correlations (r) between terminal body weight and articular cartilage erosion were r = 0.20, 0.21, and 0.22 (P > 0.05) for cohorts A, B and C respectively, indicating that less than 5% of the apparent surface erosion in the OVX group can be attributed to the effects of an increased body weight (data not shown). Estrogen receptors are found in a wide range of cell types in the body, explaining the pleiotropic effects of this hormone . The effect of estrogen on several estrogen-responsive tissues such as endometrium, bone, and breasts has been extensively studied. In the present study, cartilage turnover and morphology were assessed in sham-operated and OVX rats to investigate whether cessation of endogenous estrogen production may influence articular cartilage turnover and integrity. Our findings show that ovariectomy induces a significant increase in the breakdown of collagen type II and subsequent articular cartilage erosion. Furthermore, we demonstrate that administration of exogenous estrogen or a SERM to OVX rats suppresses the progression of these events. The assessment of articular cartilage turnover in rodents is complicated by the fact that the growth plate in these animals remains present and is at least partly metabolically active, even at older age . The growth plate contains a significant amount of collagen type II, which undergoes constant remodeling during ectopic bone formation and thereby contributes to systemic levels of collagen type II metabolites . Accordingly, we observed high CTX-II levels in animals below 3 months of age (Fig. 1), suggesting that a significant fraction of the analytes obtained from young rats and measured in the assay originates from growth plate turnover and not from articular cartilage. A similar situation is observed in humans younger than 20 to 25 years of age, but in contrast to the situation in rodents, the growth plates in human adults close when skeletal growth has ceased . 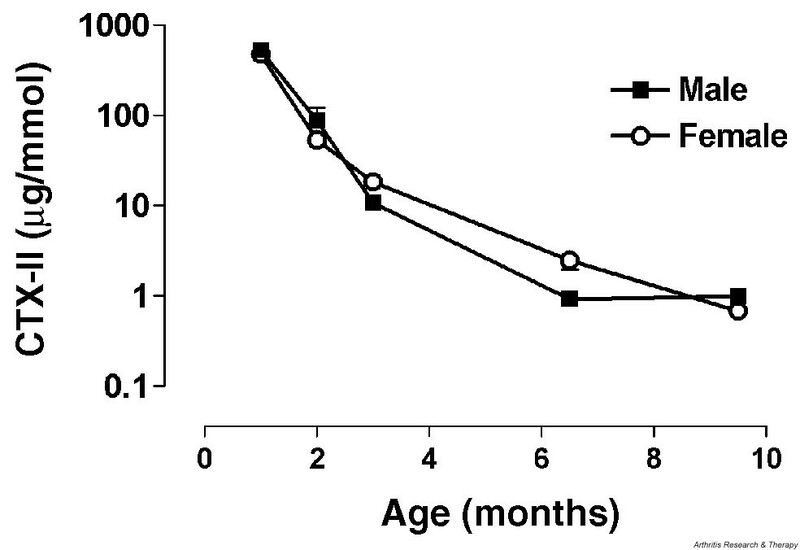 In 6-month-old rats, the CTX-II levels decreased by 86% compared to 3-month-old rats (Fig. 1), suggesting that skeletal growth and thereby growth-plate turnover at this time are minimized. These observations formed the rationale for assessing the effects of ovariectomy on cartilage turnover and structural integrity in 5- and 7-month-old rats. In OVX rats from all three cohorts, an increase in the degree of cartilage erosion of the hind knee joints was observed at termination of the study, after 9 weeks of treatment. The OVX rats had a significantly higher incidence of cartilage surface erosion in the medial tibia and lateral femur than the sham-operated rats. This tendency was also found in the medial femur, but the lateral tibia showed no difference between OVX and sham-operated animals in any of the assessed cohorts. The rats of cohorts B and C showed a more pronounced erosive change to ovariectomy. However, the changes were most pronounced in the femoral condyles in all experiments, suggesting that the relative responses of the different regions of the knee joint are similar at these two ages. The pathological changes observed in the OVX rats were of a similar nature to the very early changes observed in human OA, where mild erosion and loss of proteglycans are among the earliest changes that have been described [19, 20]. The histological appearance of the knee articular cartilage in the OVX group differs from the appearance of articular cartilage in models such as ligament transection and meniscal tear [2, 5]. In these models, more severe erosive changes can often be observed and changes such as fibrillation and vascularization appear markedly increased. The changes in knee cartilage observed after ovariectomy were relatively mild in comparison and may represent features of earlier or less aggressive disease, which are stages of the disease that are difficult to address in many of the currently used models of OA. Thus, the OVX model may be uniquely suitable for the study of early-stage OA. A significant elevation in CTX-I levels reflecting bone resorption was observed in the OVX rats in comparison with the sham-operated group. This observation is in accord with the expected increase in bone turnover induced by ovariectomy [; P Qvist and colleagues, unpublished]. 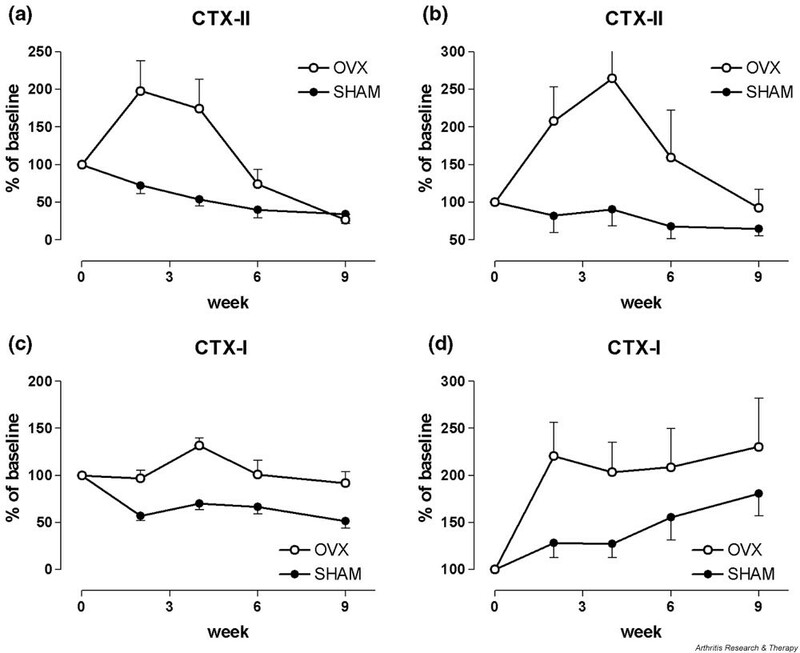 The dynamics of the changes in CTX-I levels over the 9-week study period suggests a sustained increase of approximately 100% in OVX rats compared with the sham-operated group (Fig. 6). This increase is similar in magnitude to that seen in bone turnover at the menopause transition . These observations indicate that ovariectomy in rats induces estrogen deficiency that can evoke the skeletal metabolic changes typically accompanying the menopause. These observations are in accord with findings from other studies [[12, 15, 21]; P Qvist and colleagues, unpublished]. Also, the observed increase in body weight and decrease in uterus weight observed in all cohorts as a consequence of ovariectomy is in agreement with the known systemic effects of estrogen withdrawal . Cartilage turnover as assessed by the CTX-II assay was also increased in the OVX rats compared with the sham-operated group. The difference was most pronounced in the first 4 to 6 weeks after ovariectomy, where CTX-II levels were increased by 100%, but at later time points the difference between the OVX and sham-operated animals were diminished. This observation suggests that the increase in cartilage turnover induced by cessation of endogenous estrogen production may be transient in the OVX model, possibly reflecting the activation of mechanisms antedating the actual cartilage damage. The initial increases in the levels of the marker observed immediately after ovariectomy corresponded well with the increase in CTX-II levels observed at the menopause in humans, where a 100% increase has been demonstrated . We have analyzed animals up to 15 weeks after ovariectomy, in which surface erosions were present to the same extent as seen in the rats maintained for 9 weeks. Whether the surface erosions posses the ability to spontaneously repair after longer times cannot be determined from our studies. The changes in the cartilage turnover marker (CTX-II) observed after 4 weeks showed close correlation with the histological signs of articular cartilage degradation observed at study termination (Table 2; Fig. 5). Thus, the early changes in the biomarker levels can be considered predictive of the subsequent structural changes in the knee joint. This is in accordance with findings obtained in clinical investigations, where CTX-II levels and changes in this marker are correlated with radiologically assessed damage of articular cartilage in the knee joint [23–25]. The menopause can frequently be accompanied by an increase in body weight, which can partly be ascribed to estrogen deficiency. Increased body weight, especially fat accumulation, may theoretically have an inhibitory effect on articular cartilage degradation through increased production of endogenous estrogens. Increases in body weight may also enhance cartilage degradation evoked by a greater physical challenge of the joints. In the present study, we observed a significant weight gain in OVX rats. However, there was no correlation between body weight and cartilage erosion, suggesting that the observed histological changes of knee articular cartilage in OVX rats is unlikely to be a result of increased body weight and is more likely to be due to estrogen deficiency per se. This observation is also supported by a previous study on healthy humans indicating an apparently minor overall contribution of body weight to cartilage turnover as assessed by the CTX-II assay . In the present study, we also investigated whether exogenous estrogen and an estrogen-like substance can provide prophylactic effects against the acceleration of cartilage degradation associated with ovariectomy. These hypothesized effects were investigated with reference to the well-known effects of these agents on bone turnover [12, 26, 27]. Furthermore, it has also been demonstrated that the SERM idoxifene reduces disease severity and bone erosion in adjuvant-induced arthritis, an animal model of RA . We tested a SERM belonging to the class of cis-3,4-diaryl-chromanes, which have been demonstrated to provide significant antiresorptive effect in OVX rat studies . The SERM is structurally very similar to levormeloxifene, which has been tested clinically in postmenopausal women and found to be more potent than hormone replacement therapy in preventing bone loss . The levels of CTX-II in OVX rats treated with the higher dose of the SERM or with estrogen were similar to levels seen in the sham-operated animals of the same cohort. In contrast, the lower dose of SERM was only partly effective in reducing the elevated CTX-II levels. For CTX-I levels, only estradiol treatment was able to completely suppress bone resorption to levels seen in the sham-operated rats, whereas the two SERM-treated groups showed an intermediate effect. In accord with the effects observed with the biomarkers, the histological examination revealed that whereas the vehicle-treated OVX rats again showed significantly increased erosions of the cartilage surface, the groups treated with estrogen or SERM were indistinguishable from the vehicle-treated sham-operated group. The SERM showed a dose-dependent ability to prevent the erosive changes. There was a high correlation between changes in CTX-II observed in the first 4 weeks of the study period and subsequent erosion of articular knee cartilage. The three sets of separate experiments described here were all in line with significantly increased cartilage erosion in OVX rats, pointing to an apparent chondroprotective influence of endogenous estrogen on cartilage turnover. Furthermore, administration of exogenous estrogen to OVX rats prevented the erosive changes, thereby further supporting the association between estrogen and cartilage. These observations are in accord with findings from previous studies indicating that the prevalence and incidence of OA is increased among postmenopausal women [11, 29]. The notion that cartilage metabolism may be influenced by estrogen is conceivable also, because chondrocytes of articular cartilage possess functional estrogen receptors [15, 30, 31]. Recent publications describing the results of a 3-year follow-up study of ovariectomized cynomolgus monkeys have provided strong evidence that ovariectomy induces OA-like changes in articular cartilage . In this animal model, administration of exogenous estrogens, but not phytoestrogens, was able to prevent these changes. A similar indication of potential chondroprotective properties of estrogen has been obtained in several epidemiological and case–control studies, where estrogen use in menopausal women has been associated with a decreased incidence of OA [7, 32]. CTX-II levels are increased twofold after the menopause, and supplemental hormone replacement therapy can suppress this marker to premenopausal levels, further supporting a role of estrogen as a regulator of cartilage metabolism . Based on these previous observations, it seems reasonable to consider the model of older OVX rats (i.e. 5 months of age or more) as an in vivo model of postmenopausal OA. However, the ultimate demonstration of the utility of the model awaits the introduction of novel agents with potential chondroprotective effects. The present study further supports the role of endogenous estrogens in the regulation of articular cartilage turnover and preservation of joint integrity. In addition, the results suggest that the adapted OVX model described here has potential as a useful in vivo model for the clinical assessment of chondroprotective effects of novel therapeutic compounds. We greatly appreciate the technical expertise of Trine Overgaard, Bente Therkildsen, Marianne Ladefoged, and Jonna Rungsø. We also wish to express our thanks to Karsten Wasserman, Novo Nordisk A/S for the kind gift of the (-)-cis-3,4-diaryl-hydroxychromane SERM. P Høegh-Andersen, TL Andersen, CV Lundberg, JA Mo, A-M Heegaard, J-M Delaissé, and S Christgau are all employees at Nordic Bioscience A/S. LB Tankó is an employee at the Center for Clinical and Basic Research.